If your home is not as accessible to you as you would like, it does not mean you have to deal with it or find a new place. There are many different kinds of home modifications in Chatham, New Jersey that can transform your home into a more accessible area. This means you do not have to spend a fortune purchasing a new home because these alterations offer an affordable and convenient solution. One of the more affordable but useful options is a grab bar. These are railings that can be installed throughout the house such as in hallways or bathrooms. They provide something sturdy to hold on to when moving around the property. Through our services on grab bar installation in New Jersey, we can install these throughout your home to help you move around safely. 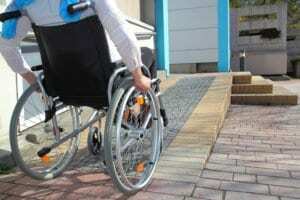 Stairs can make it difficult for wheelchairs to move from one area to another in a house. For this reason, we can convert these stairs into a ramp. This is useful for houses that are multi-level where one part of the house will require a couple of stairs to access. However, for homes with multiple stories, you will require a lift that can be installed along the staircase. It can be difficult to squeeze through a standard sized door in a wheelchair. Our solution to this is to have wider doors installed. This will make it easier for you to get through without having to worry about getting stuck or hitting your hands on the door frame. The shower can be very dangerous because the floors can get wet and you may have to climb over a tub to get in and out. Even with grab bars, this can be risky. To help mitigate the risk we can have walk-in showers installed. Those are just a few of the many different home modifications we can do, in order to make your home more accessible. If you would like to find out more about the services we provide, please do not hesitate to contact AIP Mobility Plus for more information today.